Music Balloons are perfect for every Music Birthday Party, Band Party, Choir Party, or any other Music related event. These Musical Note Balloons will take your Music Themed Party to the next level. Everyone will love them! Pack of 25 Musical Note Balloons. Assorted Neon Colors including Green, Blue, Pink, Orange, Violet, and Magenta. 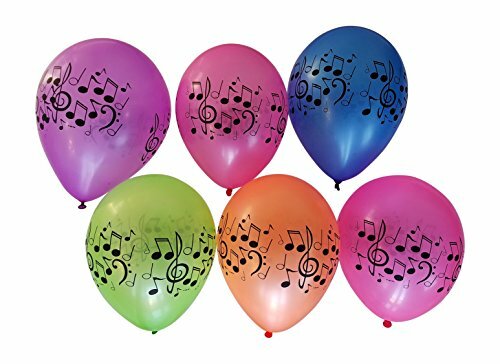 11 inch Latex Balloons with Music Notes are easy to inflate and made to hold helium. Music Balloons are perfect for every Music Birthday Party, Band Party, Choir Party, or any other Music related event. Your Music Themed Party will be awesome with these brightly colored neon Music Note Balloons. Green, Pink, and Orange Balloons will Glow in the Dark under Blacklight conditions! 11 inch Latex Balloons with Music Notes are easy to inflate and made to hold helium. If you have any questions about this product by 3Cats Party Supplies, contact us by completing and submitting the form below. If you are looking for a specif part number, please include it with your message. 18inch 5pcs Colorful Flashing Led Lighting Balloons,Great for Festive Party Decoration, Birthday, Wedding Christmas Decoration Balloons.